Everyone loves jello right? 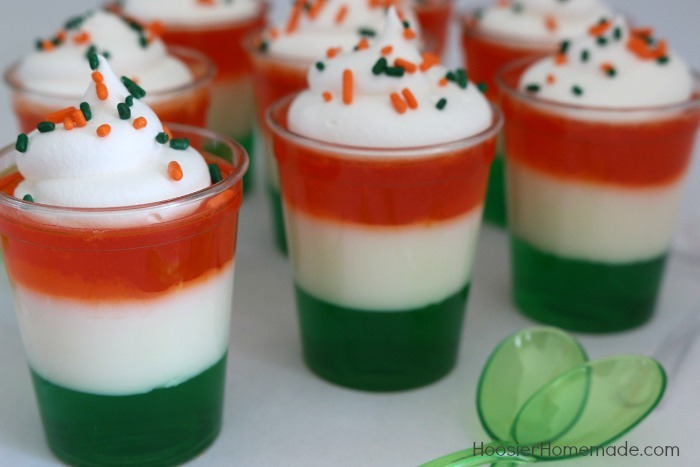 Make these Irish Jello Shots, with the colors of the Ireland flag and put them in plastic shot glasses. You can make them with or without alcohol. Aren’t they fun? The kiddos and adults are sure to love them! 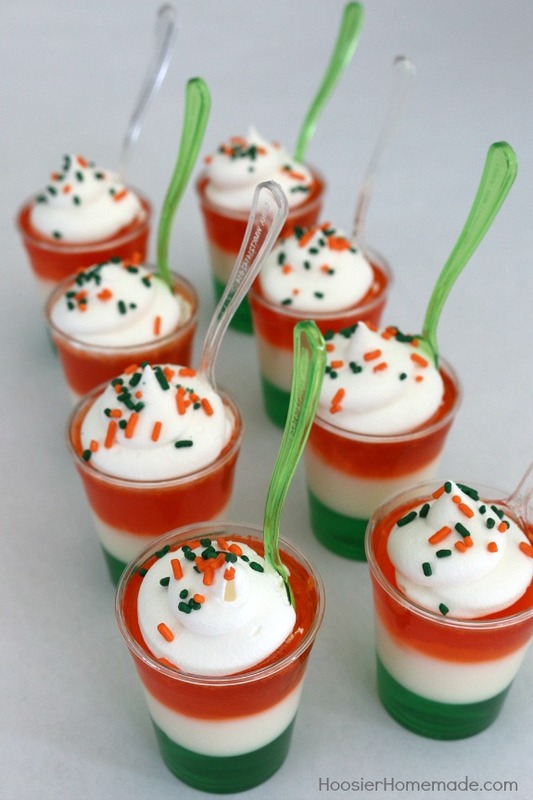 Just like the Candy Corn Jello Shots and the Mardi Gras Jello Shots, you can make these Irish Jello Shots with or without alcohol. But for today…we are keeping it kid friendly and less expensive. 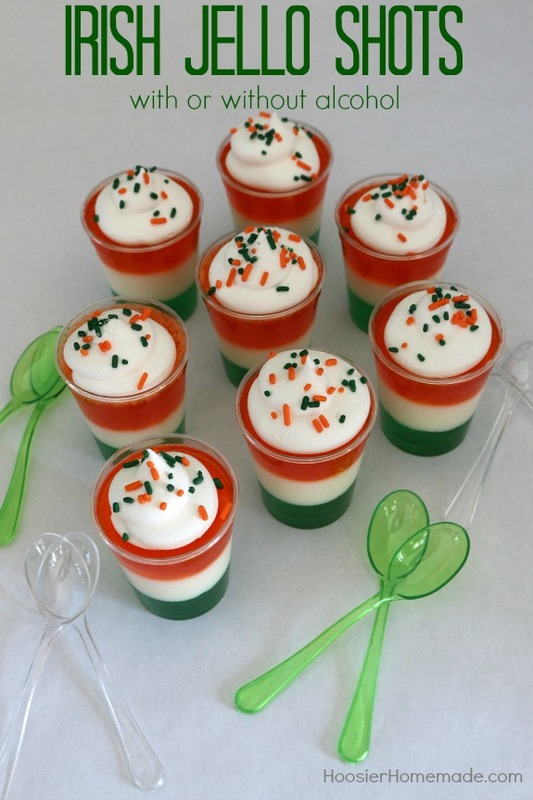 These Irish Jello Shots are made to match the colors of the Ireland flag – green, white and orange. The supplies you need are very simple, to serve the Jello Shots, you will need 2 oz plastic shot glasses. I found these at the party store. You can certainly use the same recipe and layer the Jello in a glass bowl. Begin by layering the lime jello about 1/3 full, the recipe will make about 32-36, 2 ounce size shot glasses. Each of the jello layers, as well as the sweetened condensed milk layer, are mixed with unflavored gelatin like Knox, this will give the jello thickness. Next comes the middle layer made with sweetened condensed milk. And then the orange jello layer. Each of the layers need about 20 – 30 minutes in the refrigerator to chill and firm up. Then right before serving (or up to 30 minutes) add the Cool Whip or whipped cream to the top and sprinkles if you like. These Shamrock Sprinkles would be super cute too! And don’t forget the spoons. We had these leftover from our Holiday Appetizer Bar, but Amazon has both green and orange! 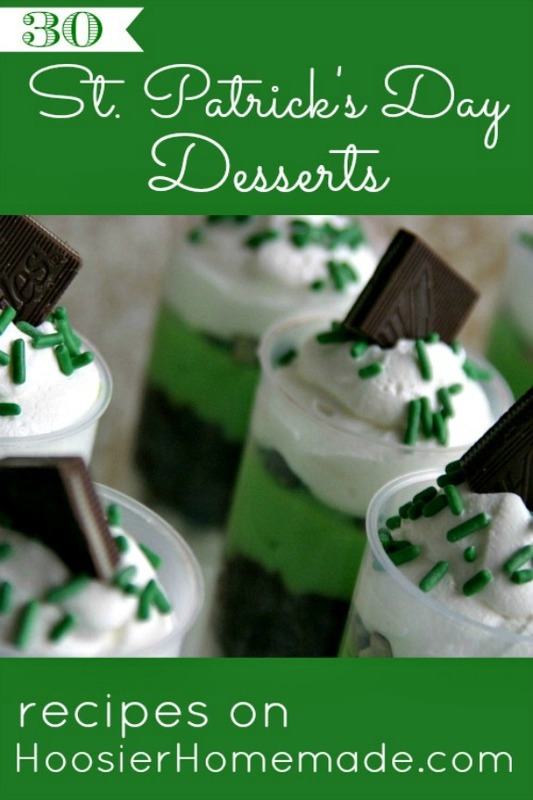 Whip up one of these St. Patrick’s Day Desserts! Green desserts, Chocolate Mint and even Rainbow Treats that are all sure to bring a smile to your families face! ! This fun St. Patrick's Day Treat can be made with or without alcohol. NOTE: This recipe makes enough to fill 36 shot glasses, you can divide the jello in half, but you will have leftover milk. You could also divide the can of milk in half, if you want the leftover milk. In a small bowl, combine lime jello, 2 envelopes gelatin and 2 cups boiling water, stir until jello is dissolved. In a small bowl combine sweetened condensed milk and 1 cup boiling water, stir well. In another small bowl, add cold water and sprinkle 2 envelopes unflavored gelatin, set aside for 1 minute. Add 3/4 cup boiling water and stir well. Add to milk mixture and stir. In a small bowl, combine orange jello, 2 envelopes gelatin and 2 cups boiling water, stir until jello is dissolved. EDIT: The following recipe is for regular flavored jello only, it does not include the white layer. The jello shots shown are non-alcoholic. If you want to make the white layer, you will need to add the gelatin to make it thicken. Note - I did not make them with alcohol. You can easily change the flavor or color of the jello for a fun everyday treat. 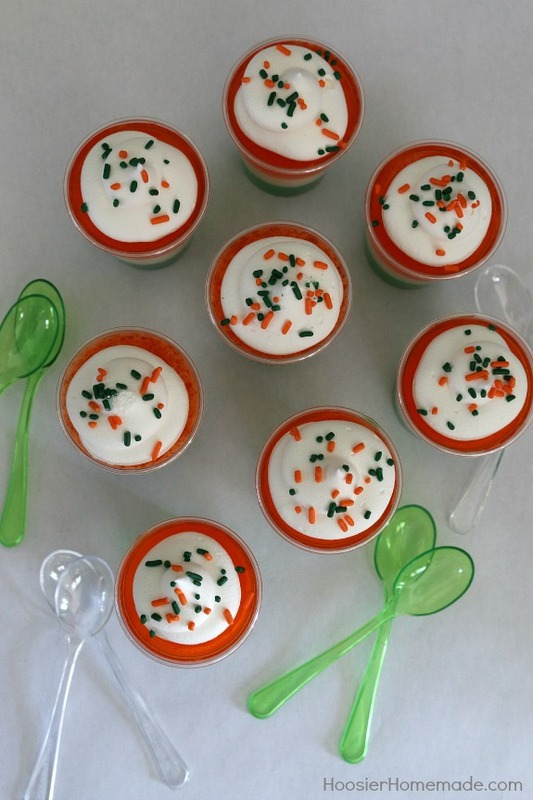 These Candy Corn Jello Shots or Mardi Gras Jello Shots are fun too! What are you cooking for St. Patrick’s Day? I want to make the adult version with vodka in each layer. Your recipe is very confusing. Please rewrite it for adult version all in one place. I don’t want to waste ingredients with a screwup. Thanks. So if I want to also add vodka to the milk layer I still use 2 Knox gelatin, right? Therwise it wouldn’t set up.? Yes Pat, the recipe shown for the adult version is for flavored jello only, not the white layer. If you want to add the white layer, you will need to add the gelatin to thicken the milk. Sorry if I’m dense, but for the adult version, do you still use the unflavored gelatin in addition to the vodka and Jello? The steps for the adult version don’t mention it. Hi Shannon! The adult version on the bottom of the recipe is for a single flavor. Note that you do not use the unflavored gelatin. Just follow steps 13-16 for each color, and then you can set them! Hope this helps! Hi Shianne, for the white portion of the jello shot, the directions are #5 through #8. For the adult version, the recipe I have listed is for 1 layer, so I suppose it depends on if you want alcohol in both the green and orange layer or just one layer, that would be up to you. Be sure to leave plenty of time for each layer to set up. Hi there, Love the look of these and want to make them next week! What size can of condensed milk? Hi Dee, the condensed milk is 14 ounce size. Silly question…what size shot glasses? One ounce or two? We used 2 ounce, Mary. Must they be eaten with a spoon or can they be squeezed out ?? Love the idea. Hi Teresa, a spoon is easiest. Fun post, and thanks for the shout-out for my CrockPot Corned Beef! Your blog is beautiful. You do such a great job with the photography! Oh thank you so much, Melanie! I’m thrilled you like it!